So wrote F. N. Kitto of the Natural Resources Branch, Department of the Interior, after he saw Port Nelson in the summer of 1918. Fifty-six years later a group of high school students from Gillam visited the “ghost town” of Port Nelson and, according to the man who led their party, Bob Bishop, they expressed sentiments similar to those of Kitto; they voiced “admiration for the men who, fighting insects in the brief summer and braving vicious wind from the Bay in winter, cleared [the] townsite and did so much building.”  Both Kitto and the Gillam students were remarking on the buildings erected at Nelson between 1912 and 1917 as part of the effort to make the site the grain terminal and harbour for the Hudson Bay Railway. General map - 8 August 1914. The story of the Hudson Bay Railway has been told many times, but major accounts such as those of A. H. de Tremaudan, Howard A. Fleming, G. R. Stevens and Grant MacEwan do not provide very much information on just how the port at the end of the line was chosen, on how much work was done at Port Nelson, and on the engineering difficulties associated with that work. This article will concentrate on these three themes and perhaps bring to light a forgotten aspect of the history of Northern Manitoba. Nelson rather than Churchill was originally chosen as the terminus for the Hudson Bay Railway because it was believed that it would cost less to develop the former than the latter. Three months before the federal election of 1908, Engineer John A. Armstrong of the Department of Railways and Canals received instructions to carry out surveys for lines between both The Pas and Churchill and The Pas and Nelson, and to provide estimates of the cost of constructing harbours at Churchill and Nelson. A year later Armstrong submitted his report; in the meantime Prime Minister Wilfred Laurier had been able to tell the electorate that his Government, if returned to power, would be able to continue planning the Hudson Bay Railway. Armstrong did not recommend either Nelson or Churchill. However, he did advise that Nelson should not be rejected before accurate surveys of the route to that site were made. The Deputy Minister of his Department, Mr. J. M. Butler, added some estimates to Armstrong’s report which indicated that the amount of money required to build the railway to, and a port at, Nelson would be $21 million, compared with $25 million for building the railway to and a port at Churchill. By the fall of 1910, when construction of the Railroad began from The Pas, no decision on the terminus had been made, but Nelson appears to have been the favoured site. Nelson was finally chosen to be the port in the autumn of 1912. By that time, of course, Laurier and the Liberal government had been replaced by a Conservative one led by Robert Borden. By that time, too, Manitoba’s northern boundary had been extended to its present location, which meant that the port would be located in that province; Ontario had sought to have its boundary extended westward to include the mouth of the Nelson, but it was granted instead an easement of approximately two hundred square miles along the Hayes River and the south shore of the Nelson estuary. Most important, by thenactually in the summer of 1912port specialist H. T. Hazen had surveyed both the Churchill and Nelson sites and, despite the preferences of mariners for the former, had recommended the latter. It seemed just a matter of time before Nelson would become a major northern centre. But time brought immense engineering problems and World War One, and the combined influence of these meant that the plans for Nelson were never realized. Hazen and his crew stayed for the winter of 1912-13 at Port Nelson. After erecting log cabins, they conducted surveys and soundings over the ice. Hazen left in March with preliminary plans for the harbour. In the spring, Hazen’s deputy, Campbell, supervised erection of a wharf for unloading supplies from the freight steamers that would begin arriving from Halifax by early August. On the arrival of those first ships, the winter camp was abandoned and the survey crew departed for Halifax. Back in Ottawa a young engineer, Duncan William McLachlan, McGill (1900), had been appointed Chief Engineer for Port Nelson, and was to report to W. A. Bowden, Chief Engineer, Railways and Canals, in Ottawa. In practice, at Nelson McLachlan held authority as Harbour Master, Paymaster, Quartermaster, Landlord, Judge, and Jury over every citizen in the town. He arrived in Halifax on 24 June 1913 where he inspected the cargoes being secured on Bellaventure, Bonaventure, and Neophite for their trips to Nelson. He sailed on the Bonazenture on 10 July, after calming a strike aboard the Neophite while still in harbour. The three ships encountered heavy ice entering Hudson Bay but arrived at Nelson safely and came ashore on 11 August. The Alcazar joined them a week later. All vessels were experiencing great difficulty unloading because of inadequate facilities at the Port. McLachlan complained to Bowden by letter at the end of August that “the wharf was botched by Campbell and has delayed the unloading considerably. It was not built far enough out to mount the derricks as intended.”  Furthermore, the work party of the previous winter had also failed to construct the buildings for men and supplies that they had been assigned to provide. This was only the beginning of many problems. Supplies on board the Cearense and the Alette were vital to the progress of Port Nelson and to the health of those who were to stay for the winter. The livestock and the Marconi wireless were soon salvaged from the Cearense but further efforts to unload the coal and timber were too dangerous because of the currents at the mouth of the Nelson river. Similarly the cargo of coal and timber on the Alette could not be salvaged amidst the swift ice floes of fall freeze up. McLachlan paid a $25 bonus to each man in a boarding party who accompanied him by whale boat to the Alette where they dynamited a hole in Number One Hold to extinguish the coal fire smouldering there. The six men in the party nearly perished in the fast flowing ice. Although the expedition succeeded in its objective, Sergeant Walker of the Royal Northwest Mounted Police, who would be critical of many of McLachlan’s actions, was very upset because of the risks and reported to his Commanding Officer that had he been there he would not have let them go. Supplies from the Alette were retrieved during the winter but the Cearense had to wait until spring when the larger tug boats could safely reach her. To everyone’s pleasant surprise, the Cearense survived the spring breakup and her cargo was successfully salvaged. Eventually a three day storm in September 1916 broke up the Cearense and ultimately scattered her remains into Hudson Bay. She was sorely missed because she had served as a beacon to other ships entering the treacherous Nelson Roads. Essential to the harbour construction was a large and efficient dredge. Polson Iron Works in Toronto was commissioned to build the dredge Port Nelson, length 180 feet, beam 44 feet, draught 6 feet, weighing 1,155 tons and with a suction line two feet in diameter. She was thought to be the most powerful dredge in the world when she was towed into Port Nelson in September 1913. No sooner had she been released from her tow than she beached on some rocks, which caused a great deal of damage to the flat bottom structure. Sergeant Walker examined her and reported, in a pessimistic fashion that was normal for him, that “Her centre is badly bent. There are iron supports five or six inches square so badly bent that they cannot be straightened at Port Nelson.”  He did not yet appreciate McLachlan’s ingenuity at improvising a solution to these sorts of problems. McLachlan’s view was that “On the beach she sustained a slight injury, which we believe will not affect her usefulness in any way.”  The dredge shifted many thousands of cubic feet of mud for several years after her mishap. Bunkhouses and warehouses, Port Nelson, 1918. Over the course of 1913-14, most newspaper reports from east of Winnipeg on the Hudson Bay route and on the construction of Port Nelson were very harsh. One Halifax newspaper planted a reporter in the work crews to feed them stories of trouble and problems. Of these there were plenty. Nearly half of the original workforce was sent immediately back to Halifax because of labour disputes. Isolation caused predictable reactions from many who complained about supervisors, food, lack of mail, working conditions, and so forth. Strikes were a fairly regular occurrence. Drunkenness was not one of the significant problems however, perhaps because McLachlan summarily fined anyone, including a Ship’s Captain, who was found intoxicated. For reasons of incompetence in their jobs he also fired a work Superintendent and a cook. When McLachlan discovered the planted newspaper reporter, he warned him to stick to the facts because he would not hesitate to expose him if anything else was printed. The stories that most hurt McLachlan and many of the men over the winter of 1913-14, were those claiming starvation and poor housing at Port Nelson. The men’s families believed this to be true but the men and McLachlan knew it was not so. There was ample food, well preserved vegetables and meat, and fresh game. The housing was warm, dry, and well ventilated as even the dour Sergeant Walker admitted. On traditional occasions, such as Christmas or Easter, there were special feasts and time-off for a holiday. McLachlan observed that there were very few colds or other of the usual afflictions. The Port Nelson camp was actually quite luxurious compared with other remote camps of the period. In addition to large dining halls and residences, there were private dwellings, a two-storey Engineering Building, a two-storey, twelve bed hospital, and the Wireless radio station. The Marconi wireless helped to relieve the isolation by bringing news from the outside world quickly. 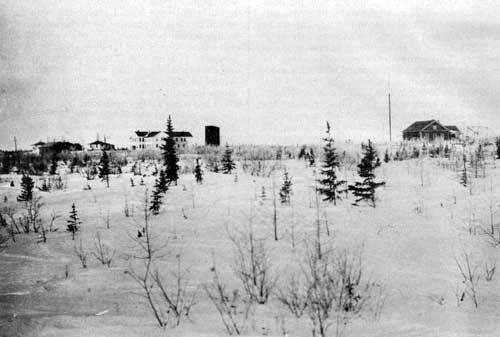 Mail service in winter was greatly improved by a tote road, operated by MacMillan Brothers of Winnipeg, from the end of steel to the camp. 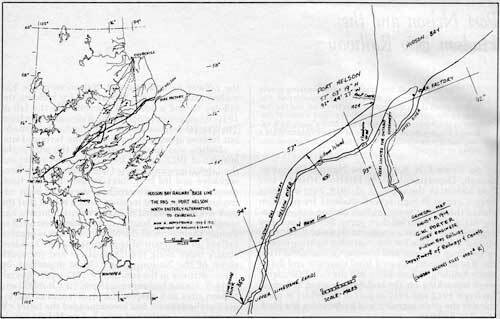 Soundings of the river bottom revealed an adequately deep channel at a distance of ½ mile from shore. The trick would be to avoid a rapid build up of silt there which could not be controlled by the big dredge Port Nelson. McLachlan believed that an island with pointed ends laying along the river flow would be sufficiently silt free. To reach the island, a bridge would be ideal. In practice, he reasoned, a multi-span bridge would be equally effective provided that the piers were sturdy and far enough apart. A modular bridge of 140 feet and 17 spans was proposed, reaching an island of one-half mile in length. The piers would be 40 feet by 62 feet, filled with gravel and stone brought by scow from a suitable place in the river bed twelve miles upstream. McLachlan roughed out his plans in the Engineering office at Nelson, giving W. A. Bowden in Ottawa forewarning of the need for a major change in thinking. Word of the change was kept confidential but Frank Cochrane, the Minister of Railways and Canals, did set back the Hudson Bay Railway project by one more year, to 1916. Even this timing was very ambitious. 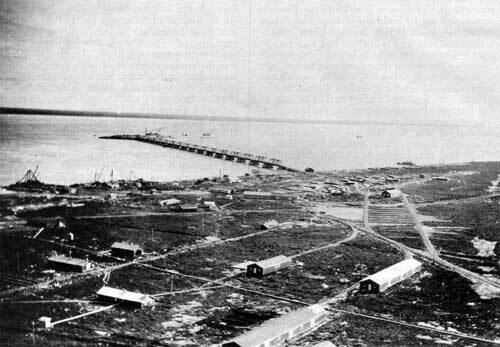 The bridge at the island, looking north, 1927. McLachlan left Ottawa by train on 27 March 1915, and arrived in Winnipeg the next evening. Early the following morning he was on a train to The Pas, arriving there a day later at 1:30 p.m. It was then Tuesday, 30 March. At 3:00 p.m. he left The Pas on a construction train and reached the end of steel on Monday, six days later. At 5:30 p.m. that day he commenced walking along the tote road to Port Nelson which took ten days. Total time from Ottawa to Port Nelson was three weeks. The engineers at Port Nelson then began their detailed planning for the all-important piers at the same time Dominion Bridge began to cut steel for the prefabricated spans. Canadian Inspection and Test Laboratories Ltd. (C.I.T.L.) were engaged by the Department of Railways and Canals to inspect the quality of steel at the mills, the work at Dominion Bridge in Montreal, and the field erection at Port Nelson. Two American mills with high quality facilities supplied 90% of the steel and Nova Scotia Steel and Coal Company made the balance. Dominion Bridge Company proceeded quickly with the shop work and suggested in June that they could offer an earlier shipment than in the contract. Initially unaware of the well developed camp at Port Nelson, they were grateful to learn that it was unnecessary to arrange for labourers, transportation, accommodation, clothing, food, and medical attention for their staff. The steel arrived in Port Nelson along with the erecting field engineers aboard M.S. Sheba on 12 October. This being a very late date for ships to be lingering in Hudson Bay, all and any means were used to get the steel off the ship. Dominion Bridge engineers were distressed that the carefully numbered and stacked pieces in the holds were dumped in mixed piles, crossways to each other which caused bending of many pieces, and generally scattered all over the place wherever the derricks and engines found space to put them down. However, by November 1 all the pieces were re-piled in an orderly fashion. W. J. Carter of C.I.T.L. arrived in Port Nelson December 20 to inspect the erection work. He found that one span had already been bolted up. Dominion Bridge brought in more men in February, 1916, and by mid-April span number 9 was in position and numbers 10 and 11 were completed. But by then they were ahead of the pier building. Under orders from Carter, several men had been occupied in nothing but straightening the bent steel from October, the expense being paid by the Department of Railways and Canals. Span number 13 was placed on 7 June but again the steel was more advanced than the piers. The entire Dominion Bridge crew was put onto building piers during June and July until span number 14 was placed on 12 August. Carter was very pleased with the quality of work and he reported that Dominion Bridge was proceeding satisfactorily considering the circumstances at the site. 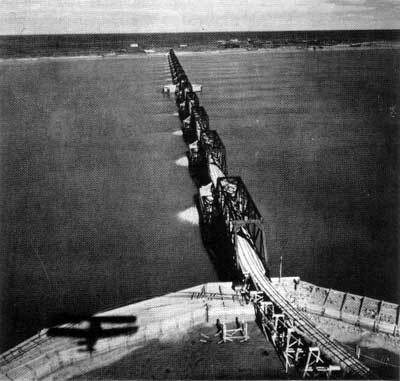 The last span, number 17, was placed on 26 August, after which everyone began the chore of driving the 109,425 field rivets to finish the structure. McLachlan himself ceremonially drove the last rivet at twilight on the evening of 2 September. C.I.T.L. and Dominion Bridge were paid in full by 22 December 1916. Expenditures directly for the bridge, which finally weighed in at 5,480,694 pounds, came to $456,788.78. As soon as the bridge was finished the anxiety switched to whether or not it could withstand the river currents and ice impacting on the piers. An old coal barge, the Bargany was purchased in Britain and towed to Port Nelson where it was sunk in a strategic place to cut up the float ice into pans no longer than one-half mile long. In June of 1917, McLachlan reported with mixed pride and caution “our bridge has stood through two seasons without injury of any kind. Bear in mind that it is none too safe yet and some more quarry work would help greatly.”  Today he would be very proud to see that it still stands straight on the piers with little silt build-up, which, considering the absence for several decades of any dredge maintenance, is a remarkable achievement. The bridge had been built, but grain elevators had not been. A design for these could not be agreed upon between the Department of Railways and Canals and the Grain Commission. The wheat people were familiar with concrete elevators and insisted on having them at Port Nelson. Railways and Canals, on the other hand, knew there was a scarcity of gravel for making concrete. They proposed making a pre-fabricated steel elevator in Toronto or Montreal and shipping it to Nelson for instant erection. The matter had not been resolved by 1917, when construction at Port Nelson ceased. There had of course been many warnings of such a shutdown ever since the war began. Doom for the project was sensed in camp when the declaration of war was heard over the radio. The Prairie Liberals were quiet when the work stopped for reasons of the war and the Western farmers, who had been anxious for so long to have the Railway and Port built, were financially content because their wheat had gone up in price from $0.88 per bushel in 1913 to $2.20 in 1917, and it kept rising to $2.63 per bushel by 1920. When construction had been going on, the winter population of Port Nelson had been around 200 men and the summer population between 500 and 1000. But in the winter of 1917-18 there was just a caretaker, and the summer of 1918 saw a mere one hundred men in camp doing river soundings. All work on the railroad had stopped. The contractor for the Kettle Rapids bridge was paid but there were no crews and no rails to lay over the completed roadbed which ran all the way into Port Nelson and connected with a graceful curve right up to the bridge. Abandoned buildings, Port Nelson, 1928. The wireless station is at right. The engineering office at center left (white building) and farther left, several private residences. The Hudson Bay Railway was completed to Churchill and the first token shipment of wheat was made from there in late September 1929. Port Nelson was scavenged for equipment that would be useful in building its successor. After that the buildings, many pieces of railroad and harbour equipment, and the bridge were abandoned. It was a ghost town, an untried engineering experiment, and an embarrassment to the governments who had invested in it. Nevertheless, Port Nelson is still an impressive site. Over half a century later the large amount of construction standing in total isolation still amazes visitors. The scene evokes admiration for the efforts of the men who tried their best and built so much in spite of unprecedented political, technical and geographical difficulties. 1. F. H. Kitto, Athabasca to the Bay (Ottawa: King’s Printer, 1919), p. 33. 2. Robert F. Bishop, Gillam School Grade XI Historical Project (Gillam: 1974). 3. A. H. de Tremaudan, The Hudson Bay Road, 1898-1915 (London, J. M. Dent and Sons, 1915); Howard A. Fleming, Canada’s Arctic Outlet, A History of the Hudson Bay Railway (Berkeley and Los Angeles: University of California Press, 1957); G. R. Stevens, Canadian National Railways, vol. 2, Toward the Inevitable (Toronto: Clark Irwin and Co., 1962); Grant MacEwan, The Battle for the Bay (Saskatoon: Western Producer Book Service, 1975). 4. John A. Armstrong, Report of the Hudson’s Bay Railway Survey, 8 September 1909, in Canada Sessional Papers, 1910, 20d. 7. PAC, DRC, vol. 1353, File 3304-8, McLachlan to Bowden, 30 August 1913. 8. PAC, Borden Papers, vol. 168, pp. 91897-91903, “Report to Minister,” 15 May 1914. 9. Canada, Sessional Papers 1914, no. 20, McLachlan to Bowden, 1 May 1914; D. W. McLachlan Diaries, PAC, DRC, vol. 6, File MG30A7, 12-13 September 1913. 11. PAC, Borden Papers, vol. 168, p. 91880, Sgt. R. H. Walker to Officer Commanding, R.N.W.M.P. “M” Division. 16 October 1913. 12. PAC, DRC, file 4482 D, Annual Report for 191b, McLachlan to Bowden, 2 May 1917. 13. PAC, DRC, vol. 2, file 3534-49, memorandum, 1913 (?). 14. Fleming, Canada’s Arctic Outlet, p. 74. 15. PAC, Borden Papers, vol. 168, p. 91965, “Private and Confidential Memorandum” (Walker to Officer Commanding, R.N.W.M.P., “M” Div., winter 1913-14?). 16. Canada, Sessional Papers, 1914, no. 20, McLachlan to Bowden, 1 May 1914. 17. PAC, DRC, vol. 1353, file 3304-3308, Bowden to McLachlan, 29 November 1913. 18. de Tremaudan, The Hudson Bay Road, appendix G.
19. PAC, DRC, file 4482 G, pt. 1, McLachlan to Bowden, 10 January 1914. 20. PAC, DRC, file 16434 A, S.S. Alette, Captain of S.S. Beothuk to Bowden, 10 October 1913; PAC, Borden Papers, vol. 168, p. 91890, Sgt. Walker to O.C., R.N.W.M.P. “M” Div., 1 December 1913. 21. McLachlan, Diaries, 14 September 1915. 22. PAC, Borden Papers, vol. 168, p. 91890, Sgt. Walker to R.N.W.M.P., “M” Div., 1 December 1913. 23. PAC, DRC, file 4482 G, pt. 1, McLachlan to Bowden, 10 January 1914. 24. PAC, DRC, file 4482 G, pt. 1, McLachlan to Bowden, 16 January 1914. 25. McLachlan, Diaries, 6 October 1914. 26. Canada, Sessional Papers, 1915, no. 20, Annual Report for 1915, McLachlan to Bowden, 20 April 1916. 27. PAC, DRC, file 4482 G, pt. 1, McLachlan to Bowden, 16 January 1914 (second of two memoranda). 28. McLachlan, Diaries, 7-8 July 1914. 29. Ibid., 11 September 1915. 30. Ibid., 2 May 1916. 31. PAC, Borden Papers, vol. 168, p. 91891, Sgt. Walker to O.C., R.N.W.M.P. “M” Div. 1 December 1913. 32. McLachlan, The Development of the Hudson Bay Project, Paper to the Engineering Institute of Canada, Ottawa, 8 February 1933. 33. PAC, Borden Papers, vol. 168, p. 91889, Sgt. Walker to O.C., R.N.W.M.P., “M” Div., 1 December 1913. 34. PAC, DRC, File 4482, pt. 1, McLachlan to Bowden, 5 February 1916. 35. Canada, Sessional Papers, 1014, no. 20, Annual Report for 1914, McLachlan to Bowden, 6 May 1915. 37. McLachlan, Diaries, 27 March - 15 April 1915. 38. PAC, DRC, file 3534-49, “The Bridge,” F. P. Sherwood to Bowden, 26 February 1916. 39. Ibid., W.J. Carter to Bowden, 26 February 1916. 41. McLachlan, Diaries, 21 September 1916. 42. PAC, DRC, file 4482 F, pt. 1, McLachlan to Bowden, 20 June 1917. 43. PAC, Borden Papers, p. 91902, Bowden to Aide Memoire, 15 May 1914. 44. PAC, DRC, file 4482 D, McLachlan to Bowden, 20 May 1918. 45. Canada, Debates of the House of Commons (1917), 13 July, pp. 3396-3397. 46. PAC, DRC, file 4482 AR, Bowden to A. Burrows, 29 November 1916. 47. Ibid., Annual Report for 1917, McLachlan to Bowden, 16 April 1918. 48. PAC, DRC, file 4482 D, McLachlan to Bowden, 17 September 1917. 49. Canada, The Senate, Report of the Special Committee Appointed to Report on Navigability and Fishery Resources of Hudson Bay and Strait, 4 June 1920. 50. Montreal Gazette, 27 May 1924. 51. Montreal Gazette, 3 February 1926. 52. PAC, Growski Papers, file 47-1, G. A. Bell to Sir Henry Thornton, 1 October 1926. 53. Toronto Globe, 31 August 1927.